Dinosaur Footprints on the Roof of the World! Once upon a time a dinosaur wandered along the beach in Kvalvågen, on the eastern side of Spitsbergen. 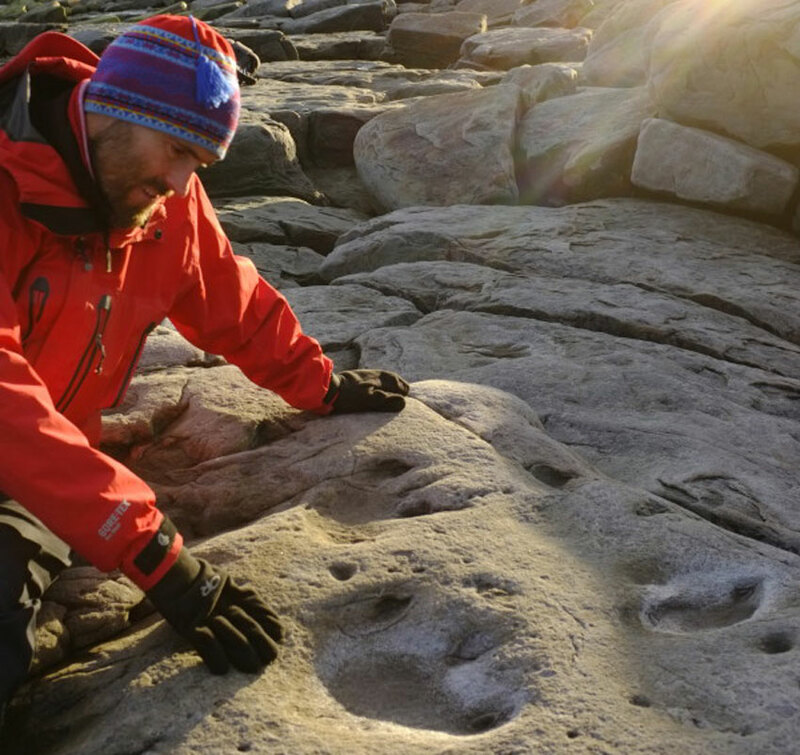 Some 125 million years later scientists from Oslo, Alaska and UNIS mapped these footprints – the northernmost dinosaur tracks discovered in the world to date. Wednesday, 30th of July: After a short wait we got a helicopter lift from Longyearbyen towards the east side of Spitsbergen. The weather turned worse during the trip and when we reached the area just east of the Svea coal mine, the snow got too dense to fly through and we had to return. Waiting until 9:00 p.m. and making a new flight out was our second chance and this time it worked. We got to Kvalvågen at 22:30 and started the mapping of the dinosaur tracks. The first tracks were found in 1976 and described in 1978, but until 2012 it was believed that there were only three tracks preserved at the site. In 2012 we discovered several more tracks. 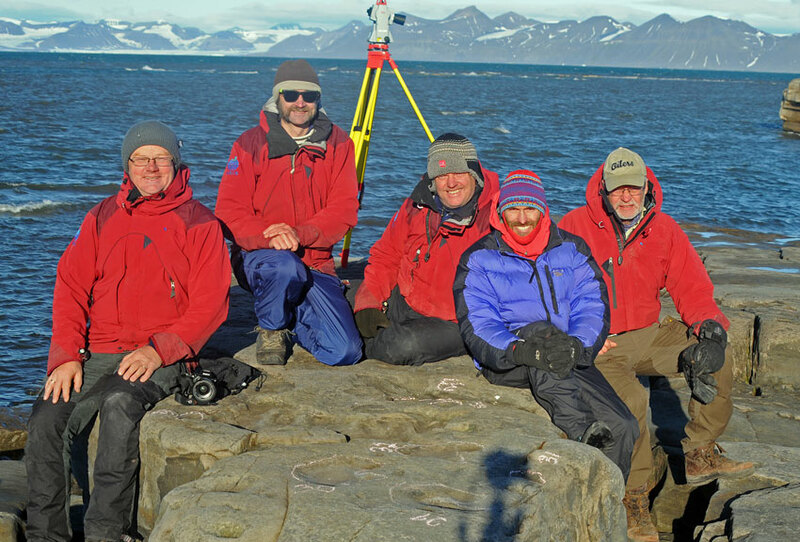 However, due to the logistics involved we were not able to visit this remote site in Svalbard again until this year. We are five scientists: The head of the short expedition was Snorre Olaussen, a sedimentology professor at the University Centre in Svalbard (UNIS), and part of the LoCra group; Øyvind Hammer, a paleontologist and computer wiz from the Natural History Museum in Oslo, where Hans Arne Nakrem (also a paleontologist) and myself work. The last participant was paleontologist Patrick Druckenmiller from The University of Alaska Fairbanks, where he has the same position as I have in Norway (Head of vertebrate paleontology collections). 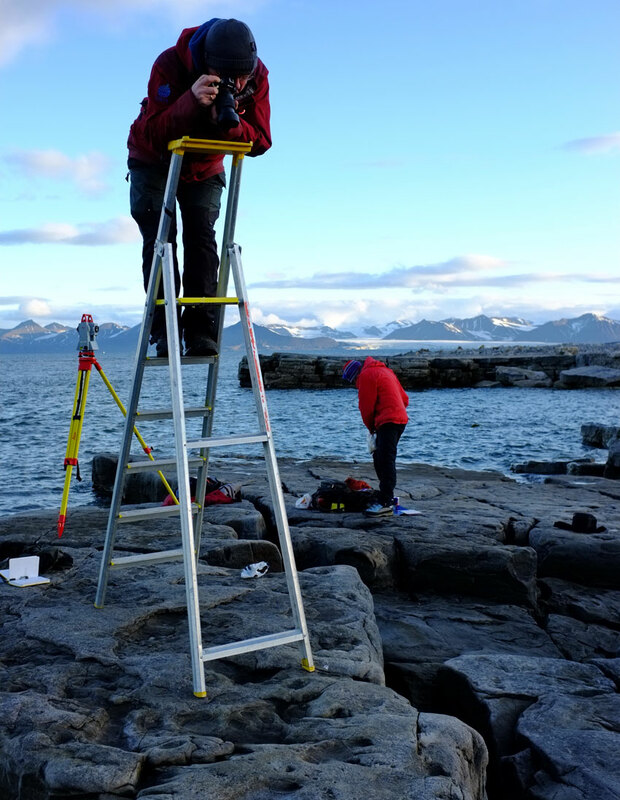 The site was spectacular, remote and cold, with the Barents Sea lapping onto a booming glacier across the bay. To see dinosaur footprints on a fossilized beach, itself now a new beach along the same ocean as in the Cretaceous, only colder, was an experience we will always remember. We mapped 36 tracks in 3D using a total station and photogrammetry methods. At least two different track makers were found including one trackway (several tracks in sequence). The tracks date to the early Cretaceous, about 125 million years ago, and are among the northernmost dinosaur tracks discovered in the world to date. Although weather threatened to delay our trip at first, it ended up beautiful, albeit cold and windy. And… finished at 5:30 a.m. The midnight sun is a fabulous thing! After our work was done, we found a sheltered spot in the sun and slept until the helicopter picked us up at 10:00. This article first appeared in National Geographic’s Explorers Journal.